The Autumnal Equinox is on Saturday, but there are already signs of Autumn in the Byward Market of Ottawa. Nothing says the beginning of Fall like bright orange pumpkins on display. This Market vendor had a wonderful display of onions and strings of garlic hanging down. Very colourful! And around the corner there were big pumpkins - the kind you could carve into Jack-O'-Lanterns. 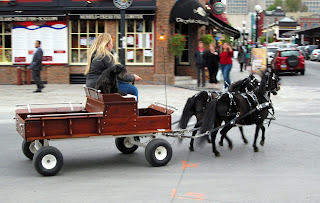 This has nothing to do with the arrival of Fall - but just as I was leaving the Market, I saw this woman in a cart, with a dog sitting beside her, being pulled by these two very small horses. I had just put away my camera and fumbled around trying to pull it out again. 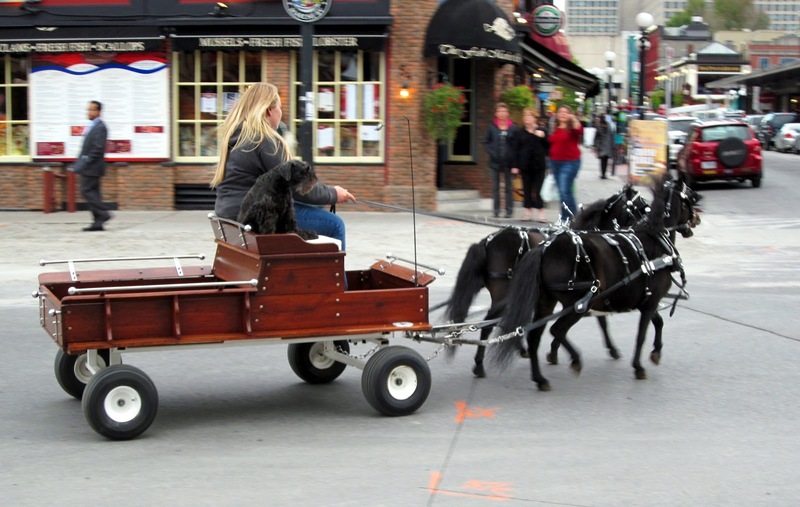 The tiny horses and the cart were such a bizarre sight in the middle of downtown Ottawa that I really wanted to take a picture. They were almost past when I finally turned my camera on. The moral of the story - always have your camera ready!